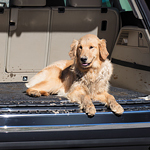 Your dog might love riding in the car with you, but pets sure can make a mess. Shed fur is difficult to get out of upholstery, and if you want to maintain your vehicle and avoid that awkward feeling you get when your guests have to brush pet fur off of their clothes when they get out of your car, you need a few tricks to get it off your upholstery. We want you to be up to date on some great tips, so here are a few. Blow up a balloon and rub it around on your body. Then, rub the balloon around the car seats. The static electricity that you create by rubbing it on your body should attract pet hair. You can also take a rubber glove and rub it on the upholstery after you wet the seats with water from a spray bottle. The water will help the fur to clump together, and the fur should cling to the glove.